Will the Nobel Help Obama Make Peace? 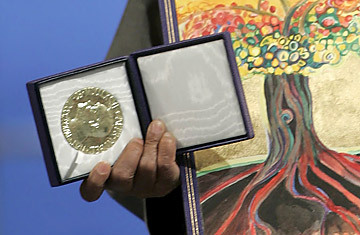 President Barack Obama was surprisingly given the Nobel Peace Prize "primarily for his work on and commitment to nuclear disarmament," according to Agot Valle, a Norwegian politician who served on the award committee. Valle told the Wall Street Journal that the stewards of the prize wanted to "support" Obama's goal, as expressed recently at the U.N., "of a world without nuclear weapons." It's tough to think of a goal more widely espoused than the dream of an H-bomb-free planet. President Ronald Reagan and activist Jane Fonda, political opposites, came together on this one  in his second term, Reagan stunned his advisers and Soviet leader Mikhail Gorbachev by suggesting a treaty that would take nuclear arsenals down to "zero." As long as a nukeless world remains wishful thinking and pastoral rhetoric, we'll be all right. But if the Nobel Committee truly cares about peace, its members will think a little harder about trying to make it a reality. Open a history book and you'll see what the modern world looks like without nuclear weapons. It is horrible beyond description. During the 31 years leading up to the first atomic bomb, the world without nuclear weapons engaged in two global wars resulting in the deaths of an estimated 78 million to 95 million people, uniformed and civilian. The world wars were the hideous expression of what happens when the human tendency toward conflict hooks up with the violent possibilities of the industrial age. The version of this story we are most familiar with is the Nazi death machinery, and we are often tempted to think that if Hitler had not happened, we would never have encountered assembly-line murder. The truth is that industrial killing was practiced by many nations in the old world without nuclear weapons. Soldiers were gassed and machine-gunned by the hundreds of thousands in the trenches of World War I, when Hitler was just another corporal in the Kaiser's army. By World War II, countries on both sides of the war used airplanes and artillery to rain death on battlefields as well as cities, until the number killed around the world was so huge that the best estimates of the total number lost diverge by some 16 million souls. The dead numbered 62 million or 78 million  somewhere in there. So when last we saw a world without nuclear weapons, human beings were killing one another with such feverish efficiency that they couldn't keep track of the victims to the nearest 15 million. Over three decades of industrialized war, the planet averaged about 3 million dead per year. Why did that stop happening? Is it because people no longer found reasons to fight? Hundreds if not thousands of wars, small and large, have been fought since Hiroshima and Nagasaki. Is it because nations and tribes found a conscience regarding mass death? Clearly not  the slaughter in China during the Cultural Revolution, in Cambodia under the Khmer Rouge and in Rwanda between Hutu and Tutsi all offer bloody proof. Is it the U.N.? Um, no. Is it globalism and the web of commerce that increasingly connects the interests of the major powers? Yes, that certainly has an impact. But the global economy is a creation of the nuclear age. Major powers find ways to get along because the cost of armed conflict between them has become unthinkably high. A world with nuclear weapons in it is a scary, scary place to think about. The industrialized world without nuclear weapons was a scary, scary place for real. But there is no way to un-ring the nuclear bell. The science and technology of nuclear weapons is widespread, and if nukes are outlawed someday, only outlaws will have nukes. Instead of fantasies about a nuke-free planet where formerly bloodthirsty humans live together in peace, what the world needs is a safer, more stable nuclear umbrella. That probably means fewer nukes in fewer hands  when Obama talks about strengthening the non-proliferation regime and stepping up efforts to secure loose nukes, he is on the right track. Nuclear weapons are only helpful if they are never used. But zero weapons is a terrible idea. As bad as they are, nukes have been instrumental in reversing the long, seemingly inexorable trend in modernity toward deadlier and deadlier conflicts. If the Nobel Committee ever wants to honor the force that has done the most over the past 60 years to end industrial-scale war, its members will award a Peace Prize to the bomb. See the world's most influential people in the 2009 TIME 100. Download the new TIME BlackBerry app at app.time.com.